Endless pools are the perfect training tool for everyone from elite athletes to those who want a convenient way to stretch, condition and keep fit. Whether it’s hydrotherapy, aqua aerobics, lap swimming or just some family fun without the need to go to your local gym, our versatile pools allow you to control the current for easy or intense swim spa workouts. They also diminish joint stress and support muscles so you can train without risk of injury. There are a huge number of endless pool exercises you can do to achieve your training goals. We’ve created a series of training guides with accompanying videos to help you work every part of your body effectively. This training guide features swim spa workouts that focus on the upper body, including the biceps, triceps and shoulders. 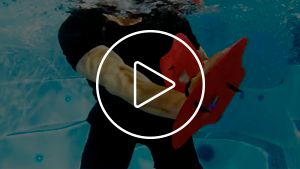 Hand paddles can help to create the extra resistance to achieve optimal results for bicep curls and tricep extensions, while resistance bands and moving closer or further away from the swim current will give you full control of the overhead shoulder press. There are numerous swim spa workouts you can do to strengthen and tone the legs. Flutter kicks, scissor kicks and leg sweeps work the legs and the core, while calf raises focus on the lower legs. 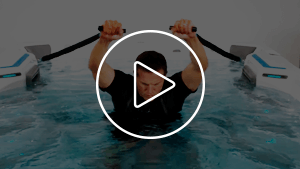 Water exercises such as skips, performed on or off the underwater treadmill, provide the same cardio workout as you’d receive on land without the gravity-induced stress on your joints. 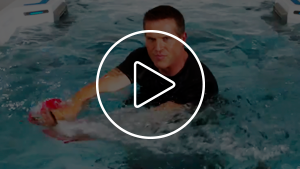 This training guide focuses on water exercises for the chest and upper body that can be easily performed in your swim spa. As well as the exercises featured in the videos, which include the chest press, reverse flys and pistons, we also introduce a number of other workouts you can do to improve upper body muscle strength, conditioning and endurance. The swim spa is the ultimate training machine for toning the stomach. Core sweeps, which can be performed with hand paddles, and bicycle kicks are the impact-free way to strengthen your tummy muscles for a flat stomach. We focus on these two endless pool exercises and feature a number of other simple stomach workouts you can do. Swim spa workouts are the perfect way to achieve a well-rounded exercise regime while supporting muscles and reducing joint stress. Endless pools can be installed inside or out, whether it’s on your deck, in a basement, or many other locations in your home or garden, enabling you to create your perfect home gym. Take a look at our range of Endless Pool Fitness Systems, SwimCross Exercise Systems and RecSport Recreation Systems and get in touch with our team to come and try them out for yourself and feel the many benefits first-hand.